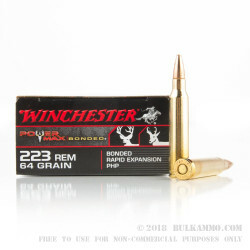 These premium hunting rounds from Winchester's Power Max line combine multiple quality features in order to give hunters a startlingly effective round against deer, antelope, and other medium-sized game. For starters, Winchester builds this load using a 64-grain bullet that will stabilize cleanly out of the most common bolt-action or AR barrel twist rates and follow some common drop charts and scope reticles for superb accuracy on target. The projectile uses a PHP (protected hollow point) tip with deep notches that allow for explosive peeling along a planned path during entry into a game animal. 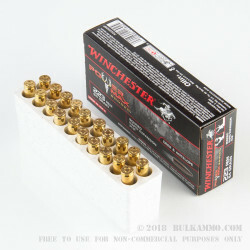 Because the bullet also has a core and jacket that are bonded to one another, this hollow point expands widely without fragmentation or early loss of momentum. 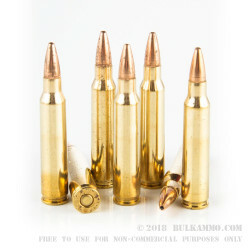 As a result, the .223 Remington round will punch cleanly through thick layers of fat and bone before coming to a halt in more vital areas of the chest, dumping a powerful shockwave into the heart and lungs while also creating a larger wound cavity for quicker bleed-out. In addition, the PHP bullet has a contoured ogive for drag resistance and jacketed base which reduces lead fouling and contributes to greater precision. Winchester completes the load with their own components which include reloadable brass casings, clean-burning propellant grains, and non-corrosive Boxer primers.